On a recent visit to the V&A I saw this lovely, hand-stitched textile. The colours, flowers and the curious long-eared animals (one playing the guitar) really attracted my attention. Imagine the work that went into this huge wall hanging (which was on sale for around £1000). I discovered it was Otami embroidery from Mexico, and in the back of my mind I remember having something like this years ago that my parents brought back from a trip to the area in 1968. 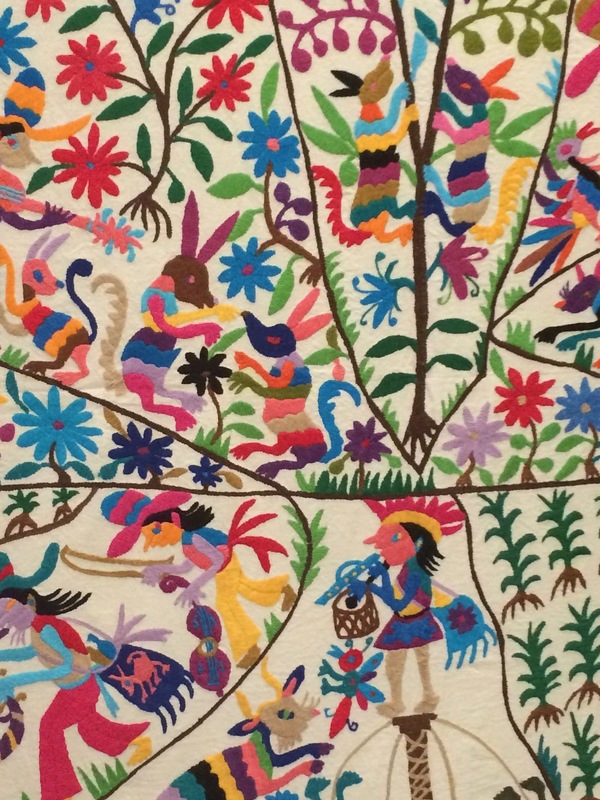 This amazing embroidery comes from Tenango, in the Hidago region of Mexico. The modern industry was introduced in the 1960s following a drought which undermined the subsistence farming (rice, beans, corn) of the local people. The design style was based on both Spanish and older Aztec styles of drawing, some copied from ancient Aztec designs found in the local caves. Many of the motifs include animals and birds, but also traditional patterns such as the Tree of Life. The style of embroidery is “false” satin stich where the thread is carried back on to the front side rather than the reverse of the cloth, producing just an outline on the underside. This is an economical approach to embroidery when materials are more expensive than labour. The stitch is not mentioned in my 100 Embroidery Stitches book. Some of these styles are incorporated into clothing which are still worn by the embroiders and for special occasions. The materials for the work are usually purchased by a relatively well to do person in the area. 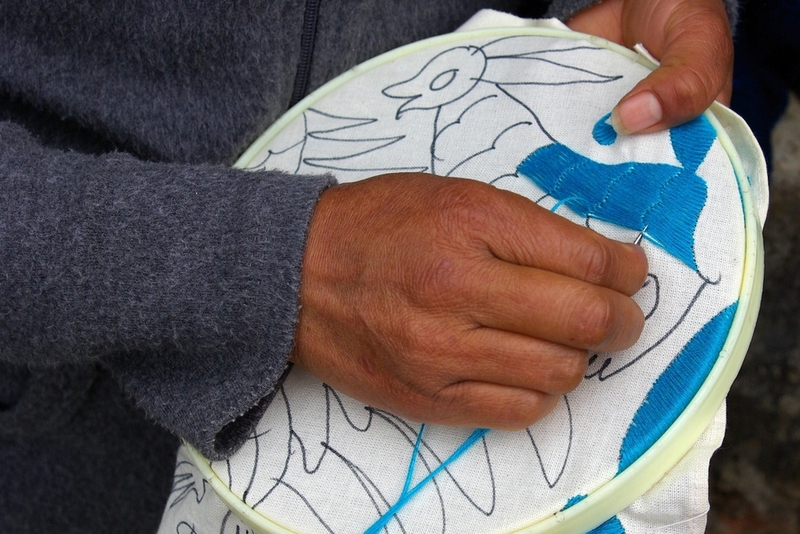 The designer draws the motifs on to the cotton backing (usually white cotton) with a washable marker pen. The designs and materials are then subcontracted to some of the hundreds of embroiders who often carry out the work alongside other tasks such as selling on the market or looking after children and the home. Men do the embroidery too, and different generations and areas have slightly different styles. The charm of these designs, to my mind, is that there is a nice balance between the individual motifs and the background space, giving the designs a graphic and modern quality. It is no surprise that the designs have been translated into furnishing fabric that works wonderfully well with Western minimalist interiors. I think these designs would also work really well for a screen print. Beautiful!!! Looks similar to crewel, love the bright colors! Lovely. I didn’t know of this, so your info is very useful, and interesting. Thank you. 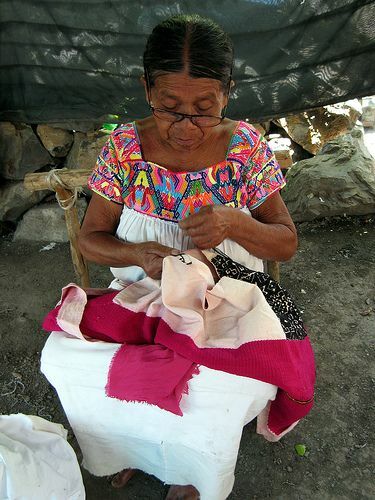 Mexican textile arts generally are fascinating and beautiful….I remember a wonderful folk art museum in Oaxaca with great fondness, as well as the anthropology museum in Mexico City and hundreds of beautiful things sold in markets large and small. Thanks for the reminder, it must be time to go back…. I have never been, but hope to go one day. Obviously it is easier if you live in the USA than in the UK. What a beautiful wall hanging. I love the way the finished item retains the freedom of the sketch drawn on the fabric. New to me and incredibly lovely. 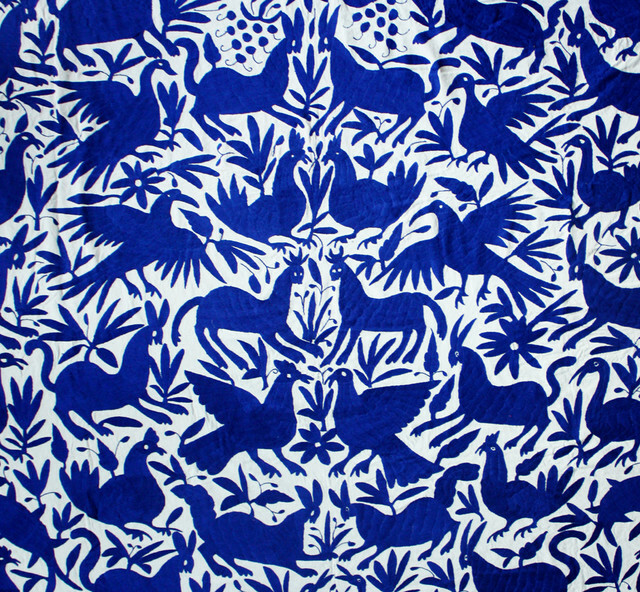 I especially like the blue and white cloth using the motifs. Wow! Your wheels are turning, can’t wait to see what this motivates you to make Kate. Fun fun fun. Oooh, I love those bright colors! The first one was my favorite….until that last blue one came up. Whatever will you do with these wonders? Just inspiration Jennifer – probably for the home rather than wearing. I didn’t splash out on the wall hanging. Lucky you Kate. Where would one buy a Mexican dress in the UK – or do you get them in Mexico? Kate, is this exhibition on during my visit? Hope so. And you’ve reminded me to pack the Mexican blouse my daughter bought me. Sorry Gail it is not an exhibition, just something for sale in the rather lovely shop. I would definitely recommend the V&A as you are staying locally. The permanent exhibitions are superb and all free. I am sorry I am not around more for your stay – but if you email me what you would like to see in London I can give you some less usual suggestions.